in 2009 a little idea started unfurling about what would become my daughter's first bed. 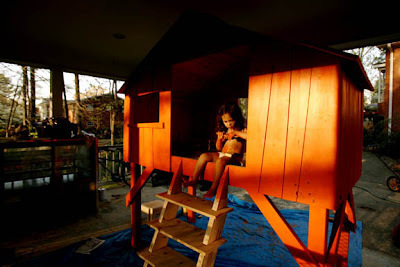 i looked all about and disliked everything i saw until i ran across an awesome post by blogger joanna goddard of a cup of jo about a treehouse built indoors from mathy by bols. now you see, i have always wanted a treehouse so i thought any child of mine would also want one. i did drawings inspired by this post and talked a friend of mine, who is good with numbers and owns power tools, to get involved. tula mirth picked out the paint with her wise two-year-old sensibilities: orange on the outside and eggshell blue on the inside. she even helped paint it in her little diaper. i love hearing her tell the story of making her bed. and so, tula mirth has a treehouse bed. we built it in 2009 and it has survived a move and a large birthday party with boys leaping from it's steps. i look at it and smile. it is good memories and i enjoy how everyone, no matter how large, wants to climb inside. Love, Love, Love!!!! I want one just like it! I posted this to the C.R.A.F.T. facebook page :) I want ONE! How fabulous! I can't imagine any bed I would have wanted more as a child. I would have DIED if that was my bed! Love this so, so much. Absolutely love! The tree house looks amazing - thank you for sharing. We came by your blog through a Cup of Jo and following now and looking forward to reading more. I'm falling short of words....really cute and fab idea. I wish i had one like this for my son. This is INCREDIBLE! My favorite part is how you let your 2 year old pick the paint colors- she did a great job! Such a happy place to grow up! This is brilliant, and I also love the style of your daughter's room, the masks on the wall look great too. Woooooow! I want one of these, and I'm a "grown up!" oh my gosh. i want! how creative. 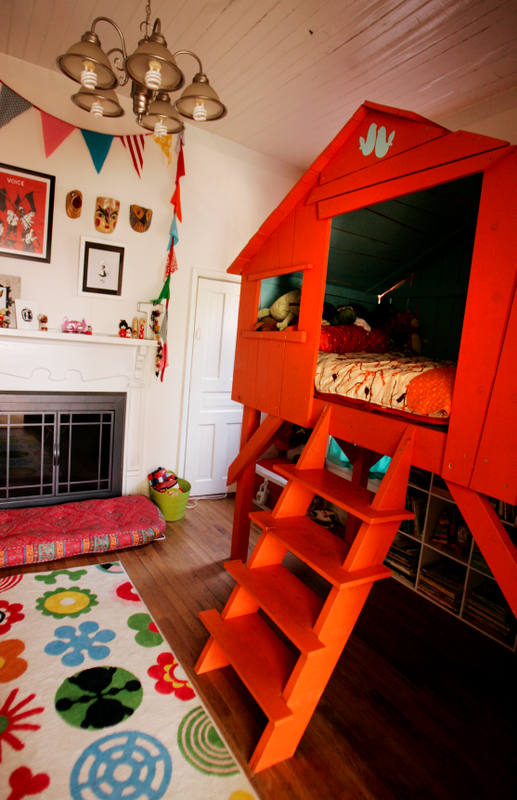 what a fabulous haven for your little one to crawl into each night. That is absolutely beautiful! Such a fantastic idea and well executed. Bravo! thanks so much everyone for your kind posts about the treehouse! we love sharing it. Alright... That's got to be the cutest thing I've ever seen in my entire life. Oh my gosh! So amazing and whimsical! Wow! What a great idea! Looks amazing!! It doesn' get any better than this!!!!! LOVELY! 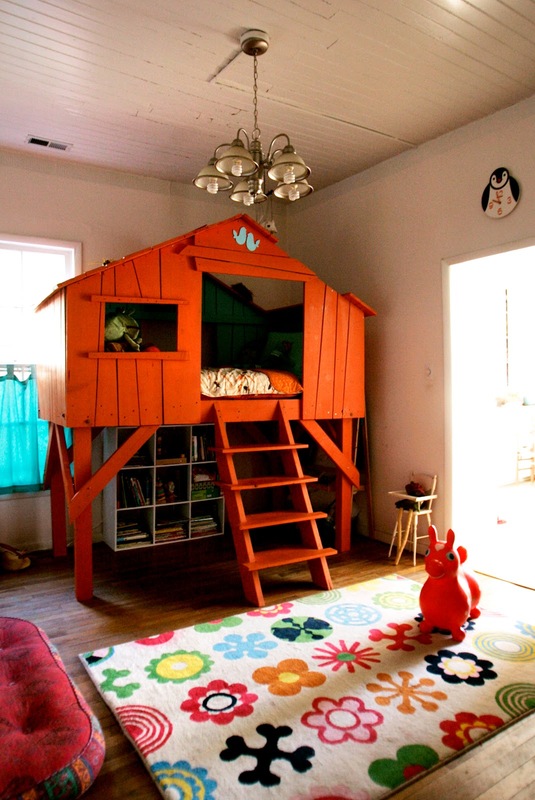 I really want to build one of these for my kids when they grow up! AWESOME! Visiting from Cup of Jo. :) Happy weekend!!! I saw this at KidCrave today and was absolutely smitten. I want one!! (for the kids, of course!). Just beautiful! Hi! 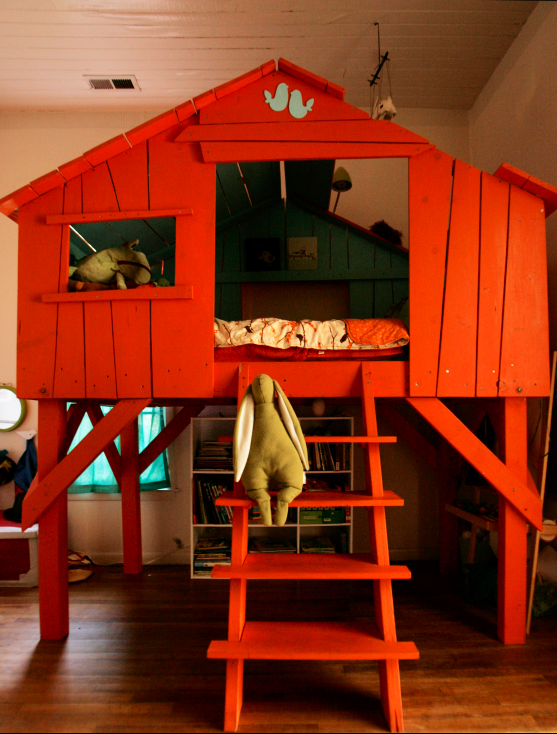 I love your blog and I just wanted to let you know I made mention of you on my blog about this amazing bedroom treehouse for tomorrow! I hope you don't mind...what an inspiration! totally inspired by this. Greg loves it too. i am thinking about trying to build one of these for my son. Did you just make up the design on your own or did you get it from somewhere? I think it is so fun and cute! Thanks for sharing! hi emi. i based a drawing off a link to a treehouse that joanna blogged about but unfortunately the link is no longer up. i had the help of a friend who has experience building so he helped sort out the math for the structure. there are also several books about treehouses which you could check out and adapt within your interior space so you would not have to start from scratch. Hey there! I am Stephanie, the Managing Editor at Offbeat Mama. I'd LOVE to feature this bed on our site if I can! Just let me know. stephanie@offbeatempire.com. VERY cute!!! I love the color, the design, and feel of the room. You are brilliant! This is STUPENDOUS. Might just end bedtime battles in our house for good. I want one for myself! Very inspired by this - thank you. This is incredible! I love everything about it ... I secretly wish it was mine! if only my ceilings were taller I'd build one for me! This is so cool. How tall is it? Would you share the blueprints with us? I would love to build it in my attic for the kids. for those of you wondering, the treehouse is 8 feet high. i don't have any blueprints as the treehouse was developed from rough sketches i did and i built it with a friend who worked out the math on scraps of paper. so sorry! there are some DIY treehouse books out there that could be helpful in adapting an indoor treehouse. I LOVE this! I saw it featured earlier this week at Odeedoh, and have been trying to convince my husband since that our twin 2-year-old boys *NEED* one! Amazing Treehouse bed!!! Really creative idea - I'd love to have a grown ups version! hi sarah! thanks for your kind comments. the rug came from ikea. amazing. great job, I wanna make one. many, many people have asked about the plans for the treehouse bed and i must confess that i never did any proper plans of the bed. i looked at a photograph and adapted that into a few sketches on some scrap paper. a friend, who is a whiz at math, worked out the measurements, some of which, were written onto the actual boards of wood as we went along and were never transcribed in any other place. the treehouse is eight-feet in height and was built to hold a traditional twin mattress. the mattress was placed inside the bed before the fourth wall and roof were put into place. i hope this helps some of you with your own treehouse projects. please send me an email with photos of your own beds! I love this and am planning on building one the question is what about my other little boy? if I have a 5 year old and 3 yo eventually sharing a room I don't want two of these, any ideas?? just wondering: did you make it inside the room? 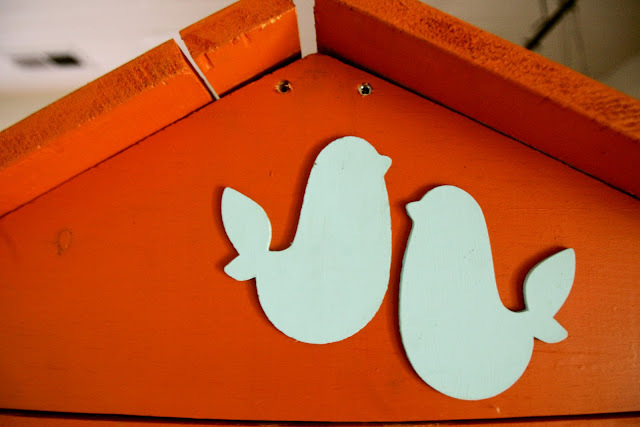 I want to have this done, but can't imagine how it would fit the door of my daughter's room. we built it outside in a garage and then took it apart and reassembled it inside. the treehouse has actually even been moved to a second home. we designed it so that all of the walls, the stairs, the base and roof can be transported. Love! Can you please tell me where I can find that rug? Thanks so much! we love art, music, passion, design, food, thought, architecture, handmade things and we'd like to share with you. give me a food zine!